My house is a disaster. There is clutter everywhere. The worst part is that when I clean a room, or part of a room, it is just as messy the very next day. And when I say ‘clean’, I really mean ‘declutter’, because let’s face it, there’s only so much time. Other than the kitchen and bathrooms, my house doesn’t get much attention. I don’t really need to decorate for Halloween, because the dust and spiderwebs are already up. There is definitely more I could do on a day to day basis, but when the kids don’t need my immediate attention, and we aren’t playing, I choose to relax and ‘check out’ online. Cleaning can’t compete with that. I have visions of my house being organized, clean, and free of clutter. It’s so appealing to think of living in a space like that, but the enormity of taking on that project is so intimidating that I can’t even start. And like I said, what is clean today, is a mess tomorrow. Having said that, I’ve decided to try something different. I’m going to try and clean one small space every day. Depending how I feel that day, it may be a really small space. Or one small thing. The difference is that I’m really going to clean it, not just declutter it. So, instead of just moving crap around every day, I’m going to look at a space and first decide if anything needs to be donated, then clean, and then move the rest around into an eye pleasing arrangement. I tried it out yesterday, deciding to do one corner of my family room. Here is one corner of my family room. No, I’m not joking. I even cheated a little bit with this photo, because there was a table in the corner with crap on it. I moved that into Logan’s room, and put his Little People play sets on it. You can see my problem here, right? Too many toys! Our basement is not finished, and we have already designated our dining room as the ‘Thomas the Train’ room. Where is all this stuff supposed to go? 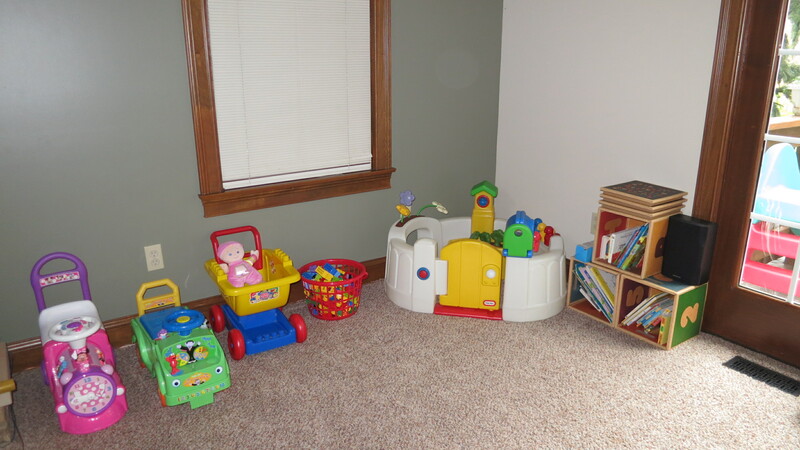 I moved everything out of that corner, vacuumed, cleaned the baseboards and wood around the window, and cleaned the toys that went back into place. I am going to have to make some hard decisions about the toys. Some can go into the kid’s rooms, but others need to be donated or sold. 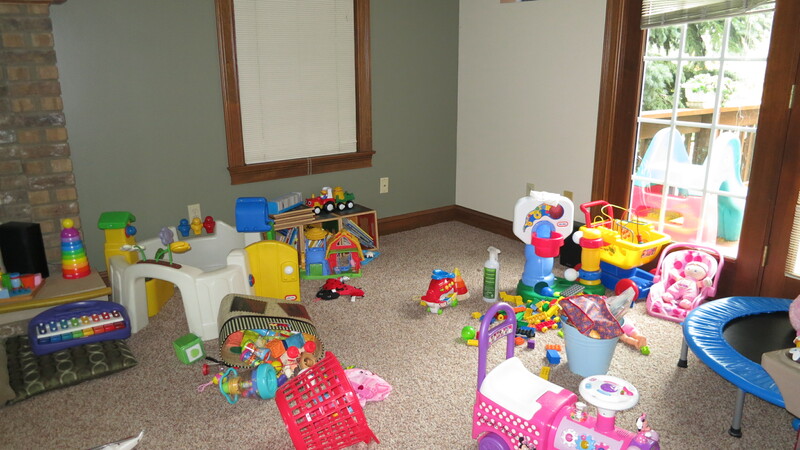 I moved a few into the ‘donation room’, and the others were moved into another area of the family room, because I want to see what toys don’t seem to be generating any interest at all. The after photo. How long can this last? So, here is the new space. I am going to get some shelving this weekend, and that will help with some of the loose toys. If anyone else has any other suggestions, I am open to them! This entry was posted in Home, One Small Thing, Simplifying and tagged cleaning, decluttering, one small thing, organizing. Bookmark the permalink.